I did something pretty fun this morning! My friend Whitney invited me to her Kindergarten classroom to speak as a beekeeper since she was finishing up her unit on insects. She works at the same school I used to work in (that is actually how we met, our classrooms were right next to each other) so I stayed to have lunch with my old Kindergarten team and it was nice to see everyone and catch up. Ayden stayed with my parents and I was able to run a few errands afterward which was a nice change of pace since I did not have to get him out and put him into his car seat at every stop I made. I missed him though! Ayden has crossed over into what a lot of people label as "terrible twos" territory. I don't really like to give it that label because looking at it in such a negative light just makes it that much more difficult to deal with. He is choosing more battles, doing things to purposefully test limits that have already been set, he is even hitting and pushing sometimes. None of this comes as a surprise to us and though we are definitely trying out different tactics to find the best way to handle these behaviors in Ayden specifically, we are not writing him off as "terrible" by any means. Along with him exercising his free will and working hard to find and understand his limitations (which can definitely be exhausting at times), he is also blossoming into an amazing individual. 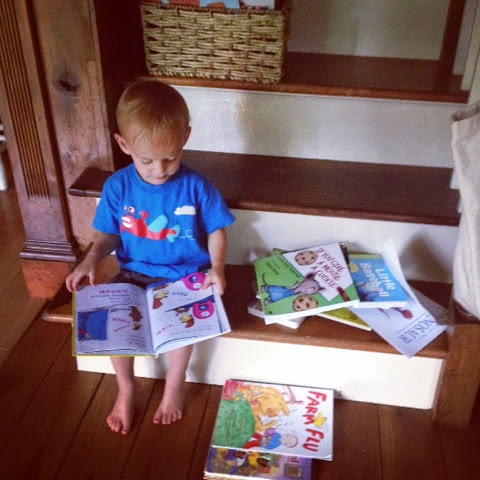 He is growing more affectionate and beginning to use manners independently and appropriately. His attention span and desire for independent activities is increasing more and more everyday it seems. He is asking permission before doing things and is just so excited about life in general. Enjoying an orange juice popsicle on our walk this evening. 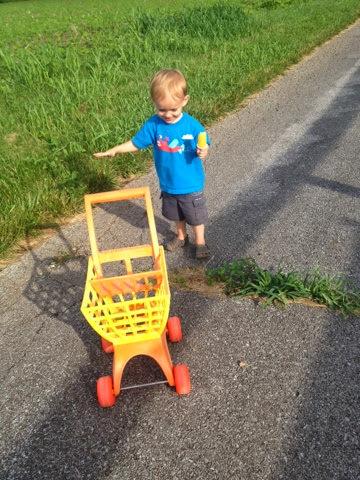 He likes making his cart "jump" over the grassy spots. He is doing what we all need to do which is maintaing balance. Do I sometimes wish that he could just be easy all the time? Of course I do! But when I really think about it, him being able to exercise his free will and have a say in what happens to him is one of the things that I want most for him as an adult in this world. Why should I wish it away for him as a child? The best thing we can do during this phase (and that is exactly what the "terrible twos" are) is maintain as much patience as we can and guide him as best as we can until we reach the other side. Also, I might add, most parents tell me that the "terrible twos" are a joke and that it's threes we should be on the lookout for. Fun fun! Haha. This evening Ayden and I had a really special moment. David was off working at the building site and I was putting him to bed. After his bedtime stories, we sat for a half hour and just chatted, cuddled and played a little. We were both so present in that moment and we had a real, full conversation. It gave me a glimpse of mother/son chats to come and it felt really good. 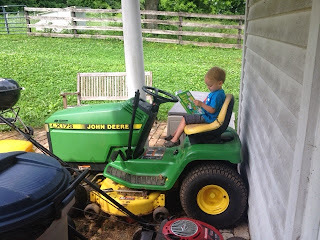 As sad as I am that he is growing up, I love that it is allowing us to connect on a whole new level. And on that note, I shall leave you with a few cute video clips of our tenacious two year old. He is a boy who knows what he wants (usually some sort of control or say in any given situation) and tries his best to hold onto it. Flashback! 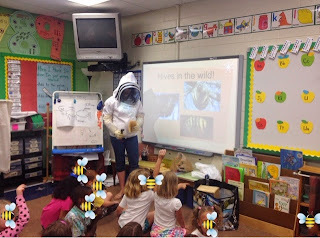 Here's what we were up to one year ago today: "Being a Punctual Parent"
And two years ago today: "Splish Splash"
What a great opportunity to share the wonder of bees and beekeeping with the kids. Maybe some of them will want to work with bees when they get older! I don't use the phrase "terrible twos" either. That's a great phrase you came up with! 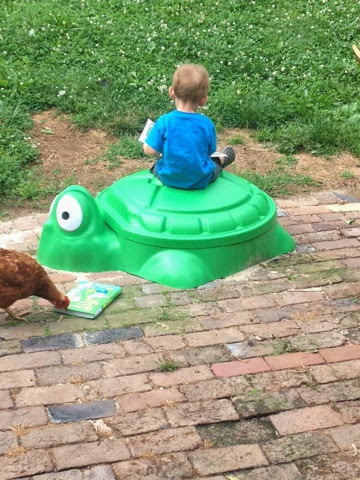 Some days with my 2 year old are challenging but he is an amazing person. I don't expect him to be on his best behavior because he's two but when I do see his growth, I am so impressed!